Audrey J. Wessing, 97, of Lomira was called home to be with the Lord on Sunday, October 21, 2018 at Hospice Home of Hope in Fond du Lac. She was born on June 17, 1921 to the late William J. and Gladys (nee Wrucke) Schill in Fond du Lac WI. Audrey graduated from Lomira High School as class president in 1939 and attended Whitewater Teachers College. In April of 1941 she was united in marriage to Henry B. Wessing at St. Mary’s Catholic Church in Lomira. Audrey was a member of St. Mary’s Catholic Church and the Ladies of St. Mary’s. She volunteered with many local organizations including the Girl Scouts, Cub Scouts, the Red Cross Bloodmobile, voting polls and many school and church activities. 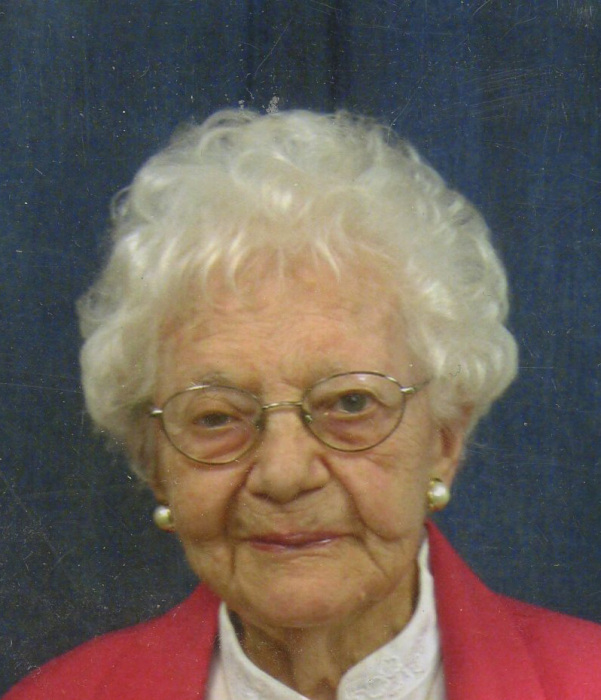 She helped organize the St. Mary’s Home and School Association and served as its first president. Audrey was a dedicated homemaker always taking care of her family. She was an excellent baker and cook, her recipes remain family favorites. She enjoyed gardening and canning. She was a devoted wife, mother, grandma, great grandma, and great-great grandma. She will be dearly missed by all who knew her. Those Audrey leaves behind to cherish her memory include her six children, Sherry (Jim) Zickert, Diane (Jim) Larson, Jim (Sue) Wessing, John (Joan) Wessing, Steve (Cheryl) Wessing, and Mary Beth Dixon; twenty seven grandchildren, Todd Wessing , Tim (Shannon) Wessing, Troy (Melissa) Wessing, Michelle (Lance) Rodenkirch, Melissa (Gregory) Straub, Eric (Pallavi Jayawant) Towne, Brian Towne, Sara Sutera, Heidi (Craig) Smith, Brett (Brenda) Zickert, Scott (Jennifer) Zickert, Cory (Brittney) Zickert, Brad Larson, Matthew (Eppie) Larson, Chris (Asuka) Wessing, Justin Wessing, Nicole (Sumair) Dutta, Ann (Jamil) Wessing-Ghani, Amy (Frank) Wantz, Ashley (Randy) Kwasinski, Kaitlyn (Ted) Blatz, Emily Wessing, Cassandra Wessing, Molly Dixon, Tanner Dixon, Drew Dixon, and Mallory Dixon; Thirty Three great-grandchildren, Natalie, Charlotte, Molly, Catherine, Theodore, Madilyn, Olivia, Jillian, Karson, Eve, Stella, Rebecca, Drew, Luke, Alyssa (Jake), Tyler, Paige, Megan, Ally, Molly, Nathan, Cole, Jack, Pierson, Quinnley, Felix, Alex, Victor, Jai, Colin, Spencer, Amalia, and Fiona; one great great-grandchild, Riley Jo; a daughter-in-law, Penny Wessing; a son-in-law, Chuck Towne; two nephews, Melvin and David; special friends, Ruthie, Delores, Wanda, and Barb; and other family and friends. In addition to her parents, she is preceded in death by her husband, Henry Wessing; a son, William Wessing; a daughter, Judith Towne; and a son-in-law, John Dixon. A Mass of Christian burial will be held on Friday, October 26, 2018 at 6:00 p.m. at St. Mary’s Catholic Church, Lomira. Rev. Michael Petersen will be officiating. Private Burial will take place on Saturday. The family will greet relatives and friends at the church on Friday from 4:00 p.m. until the time of Mass. Memorials in Audrey’s name to St. Mary’s Catholic Church are appreciated by the family. The family would like to thank all the staff at Hope assisted living of Lomira for all their help and care for Audrey.